Solar Expansion Tanks are one of the most important components of any solar heating system. Most system installed in North America fail to use proper sized expansion tanks or proper high temperature rated tanks. Most installers tend to use tanks designed for hydronic heating which requires about 1/4 the size and operates on a much lower temperature. This posses a substantial liability and will ultimately cause the solar system to fail well before its uses full life. 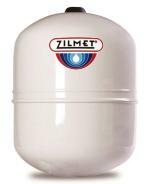 Zilmet is one of the worlds only solar expansion tanks designed specifically for Solar Heating applications. Made in Italy, the tanks use a high temperature bladder that can withstand temperatures up to 130 C (270 F). The Solar-Plus range is a well suited product for all solar heating systems, especially with when using high temperature solar vacuum tubes. he membrane of the Zilmet tanks is specially designed for solar evacuated tube heating panels, and can withstand mixture of glycol up to 60%. Stagnation: A properly designed solar heating system must be able to stagnate (over heat) and do it often. A system that is not able to handle stagnation will result in quick failure. In fact stagnation is the "off switch" in a solar system and most controllers will force stagnation at 120 C (250 F) or less to avoid damage to pumps and seals. Stagnation often occurs when the amount of solar energy exceed the demand energy plus the energy stored in the storage tank. This can happen during holidays or when a pump fails such as a power outage. When a system goes into stagnation, the pump shuts down so that the hot liquid only remains in the solar collector. The collectors may quickly reach a temperature of 210 C (410 F). This temperature is above the boiling point of any glycol mixture and causes the glycol to boil and turn to steam. The steam has a much greater volume than the liquid and increases the pressure of the closed loop system. An expansion tank must be able to accommodate the steam volume by accommodating this increased volume inside it's tank. If designed properly for the number of collectors a solar heating system should be able to stagnate for days with out any damage. In fact proper certified solar collectors such as SunRain Tz58 1800 30R must pass a 30 day test of 100% stagnation to ensure the collectors can with stand the heat before they are approved. Note: using proper solar glycol is very important. Most glycol can not withstand the extreme temperature of stagnation and quickly break down. Solar glycol is completely vaporizable meaning no liquid remains in the collector header under stagnation & it is rated for temperature exceeding 450 F.
The solar expansion tanks has a rubber membrane which separates the solar liquid loop and the other side is filled with pressurized air. As the liquid heats up and expands the pressure of the system increase to an amount greater than the air pressure inside the expansion vessel and causes the membrane to take up more liquid to the air side. This keeps occurring until the expansion tank is completely filled. At that point the pressure of the system has no where to go and will quickly be release through a pressure release valve causing hot glycol to spill over the floor. 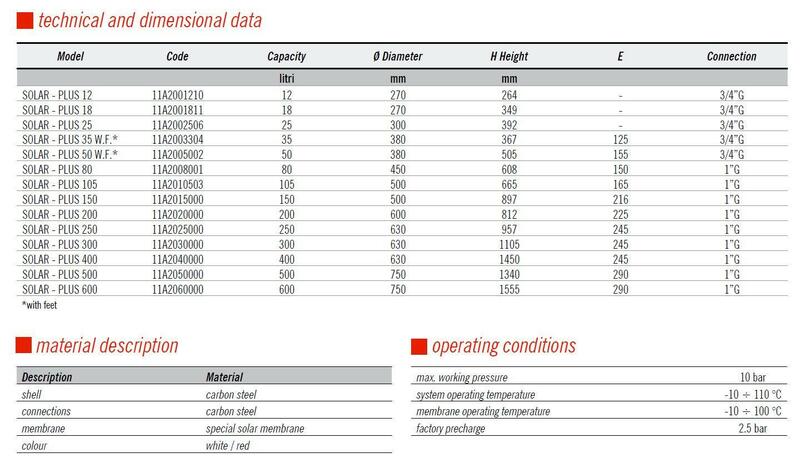 In order to prevent this, the expansion tank mus be sized correctly and the correct initial pressure of the tank must be equal to the design pressure of the system when cold. This is probably the most important part of designing a solar heating system and has many variables. However we take the guess work out of sizing by proving complete DIY Solar Heating Kits with the tank size already factored into the design. You can be assured that when purchasing any of our solar heating system you will be supplied with a safe and reliable expansion tank capable of allowing your system to safely stagnate. For those that want more information on sizing of expansion tanks click on link.